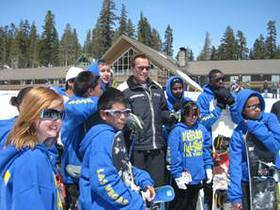 Fifty children from low-income families had the opportunity to hit the Mammoth Mountain slopes this past weekend, courtesy of Arnold Schwarzenegger's After-School All-Stars. The middle school students were treated to two days of skiing and snowboarding, lessons, lodging, meals, transportation and other events courtesy of Mammoth Mountain Ski Area. All youths are members of After-School All-Stars; an organization founded by Governor Schwarzenegger, who visited with the students on April 25th. The Governor made a surprise trip to Mammoth to speak to the children about the importance of the after school programs that they are involved with. After-School All-Stars, Los Angeles (ASAS-LA) is a leading middle and high school after-school program provider whose programs educate, enlighten and inspire thousands of students each day through after-school activities centered around health, fitness and nutrition; the visual and performing arts; and youth leadership and community service learning. ASAS-LA brings innovative, cutting-edge enrichment programs to middle and high school youth that contribute to reducing drug use, crime and violence; while increasing the safety of students in the after school hours. The organization serves 10,000 students located in disadvantaged areas throughout LA County. ASAS-LA is part of the national After-School All-Stars, which provides after school programs in 13 cities across the nation, serving over 80,000 students. Kobe Bryant is the organization’s National Celebrity Ambassador. Mammoth Mountain Chief Executive Officer Rusty Gregory also presented Governor Schwarzenegger and the After-School All-Stars Program with a donation of $5 for every lift ticket sold at the resort for the weekend, totaling over $25,000. Following his speech, the Governor hit the slopes to take some runs with the lucky children. For more information on the organization, please visit www.la-allstars.org. Watch a video of the trip here.